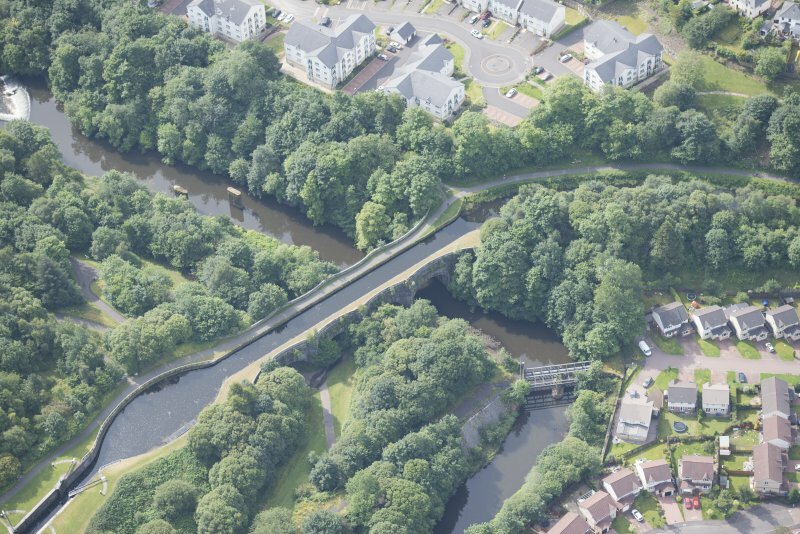 Oblique aerial view of the Kelvin Aqueduct, looking WSW. 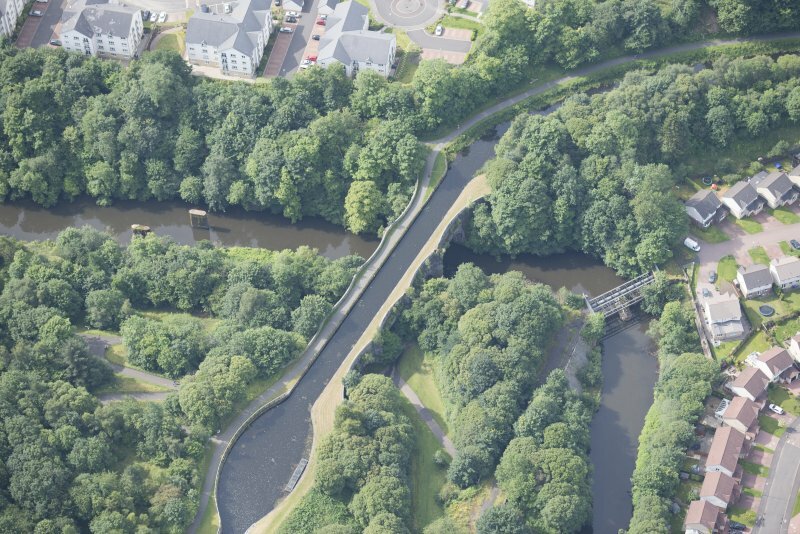 Oblique aerial view of the Kelvin Aqueduct and Maryhill Locks, looking ENE. 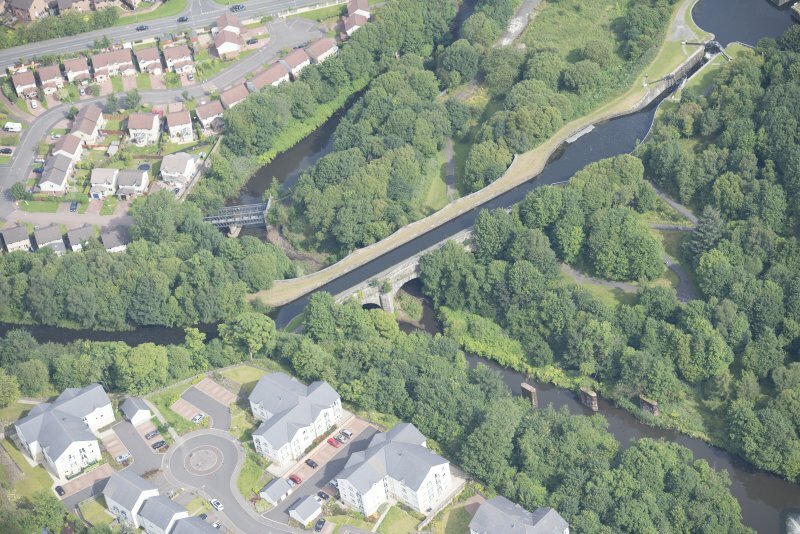 Oblique aerial view of the Kelvin Aqueduct, looking E.
Oblique aerial view of the Kelvin Aqueduct, looking NE. 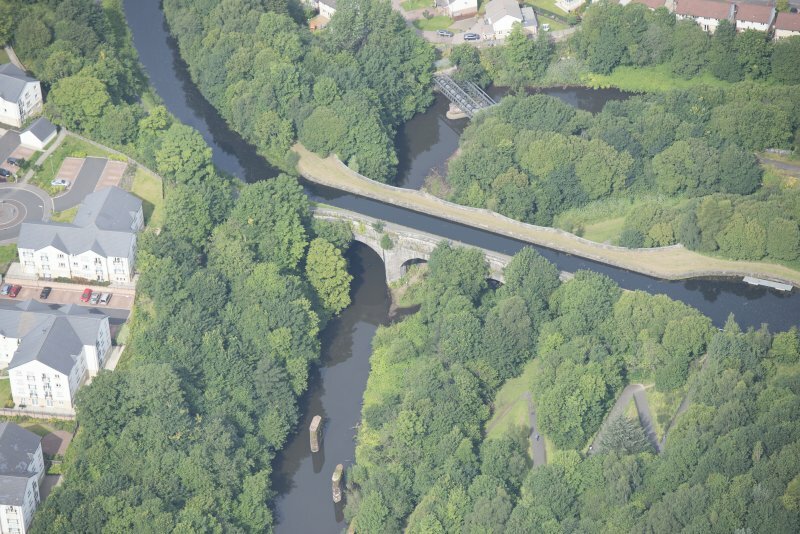 Oblique aerial view of the Kelvin Aqueduct, looking SSW. 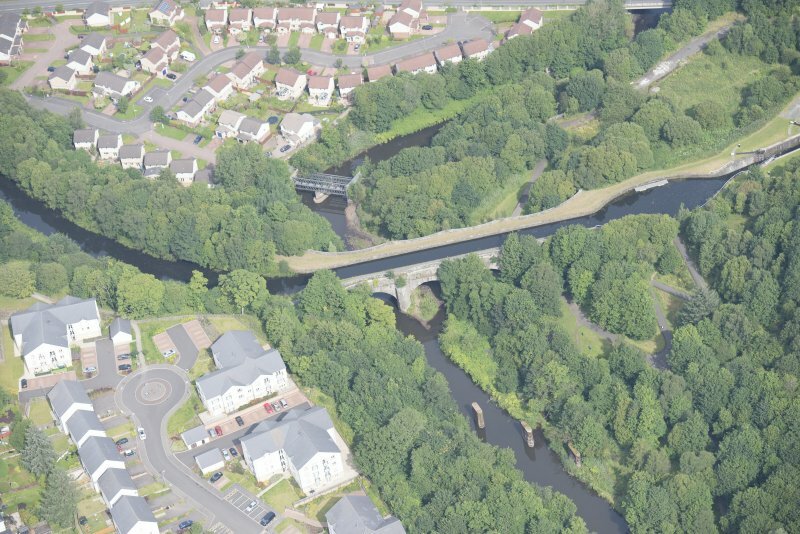 Oblique aerial view of the Kelvin Aqueduct, looking SW.
Oblique aerial view of the Kelvin Aqueduct, looking NW. 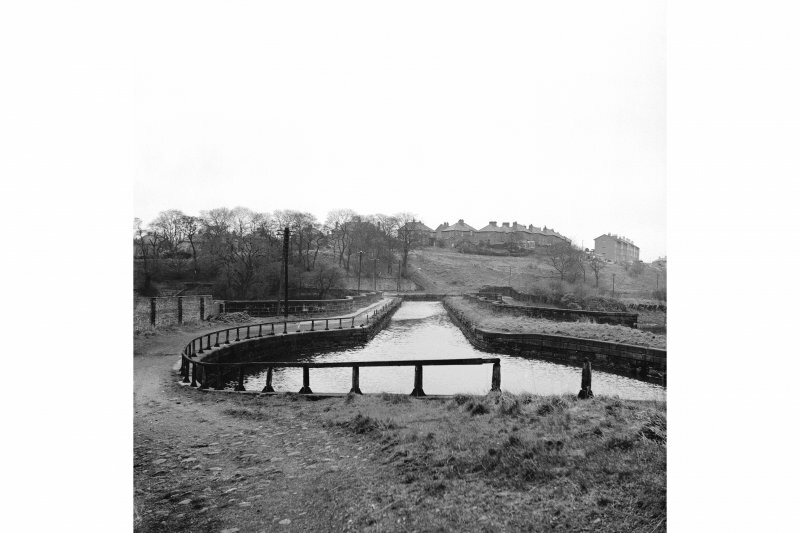 Glasgow, Maryhill, Forth & Clyde Canal, Maryhill Locks. General view of aquaduct complex from West. 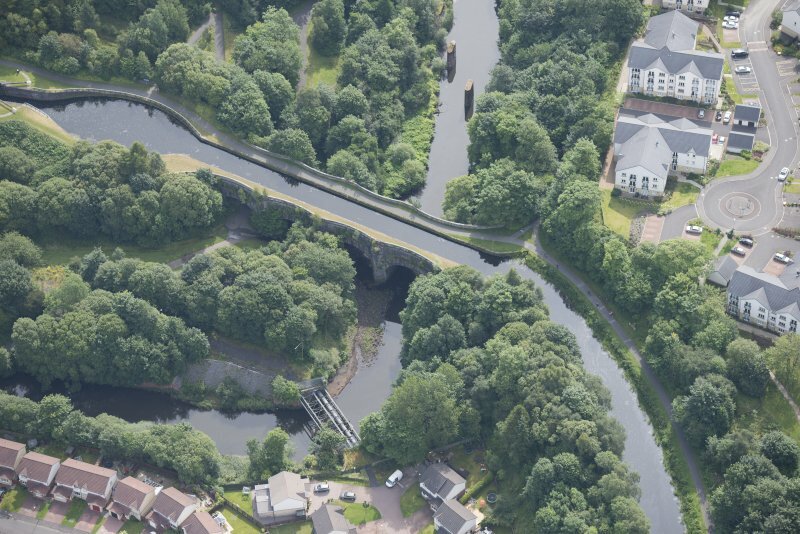 Oblique aerial view of the Kelvin Aqueduct, looking NNW. 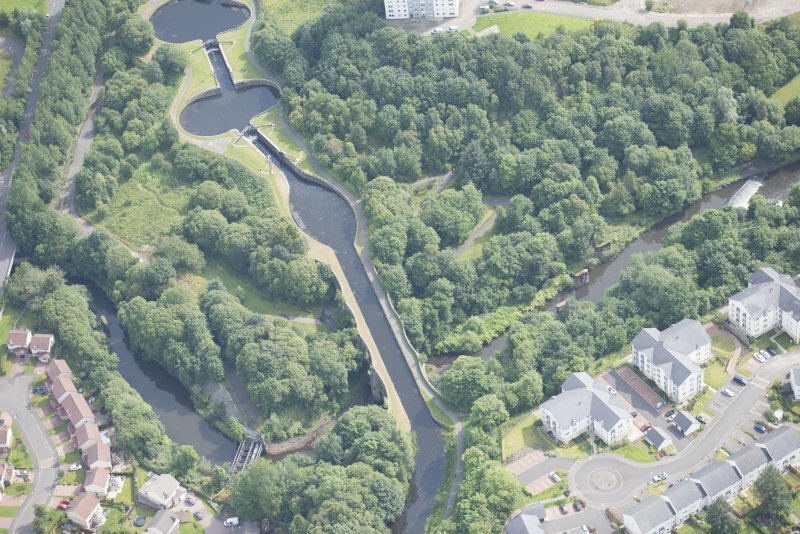 Glasgow, Maryhill, Forth & Clyde Canal, Kelvin Aquaduct. General high level view from South East. 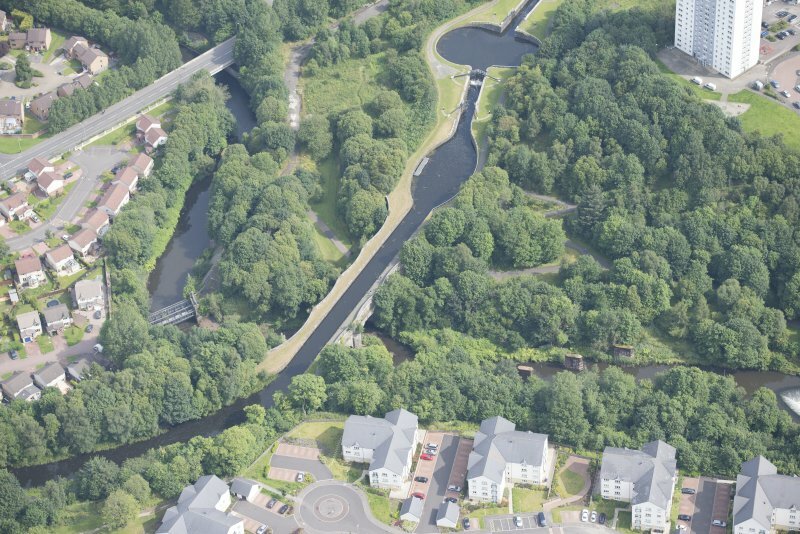 Oblique aerial view of the Kelvin Aqueduct and Maryhill Locks, looking W.
Oblique aerial view of the Kelvin Aqueduct, looking N.
Oblique aerial view of the Kelvin Aqueduct, looking ESE. 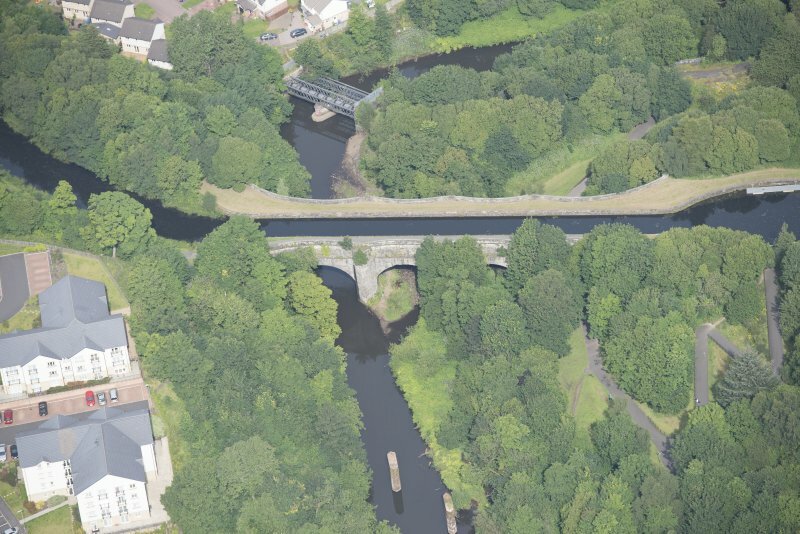 Oblique aerial view of the Kelvin Aqueduct, looking SE. 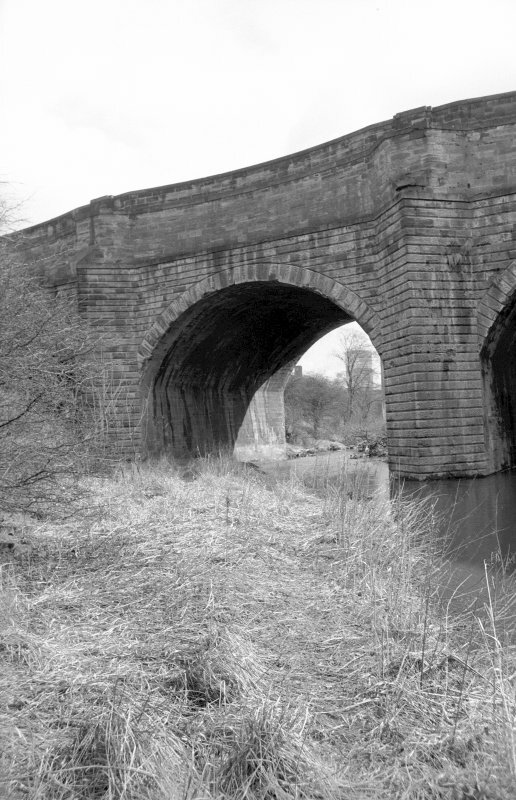 Four heavy masonry arches, each 15m (50ft) long, on buttress piers, resembling cutwaters, though only one in the river. 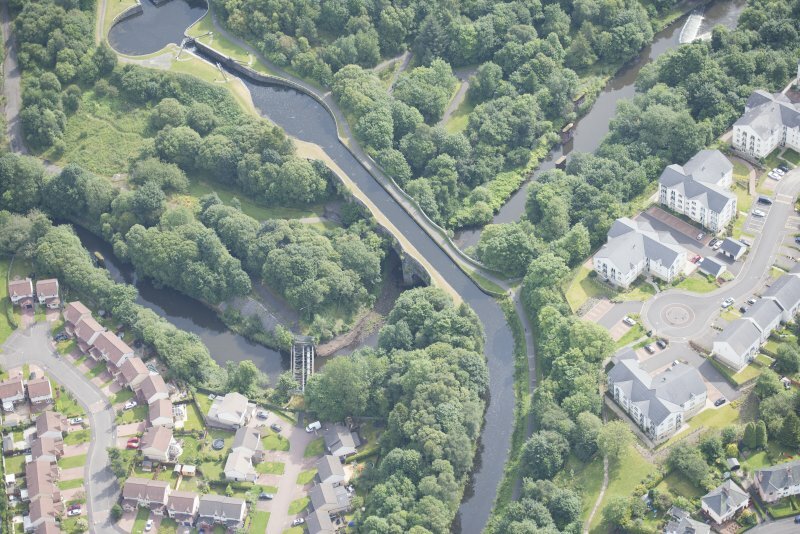 Overall spectacular structure 122m (400ft) long, 23m (70ft) high above bed of the River Kelvin carrying the Canal over the Kelvin valley. Rustic masonry at lower courses, polished ashlar above. 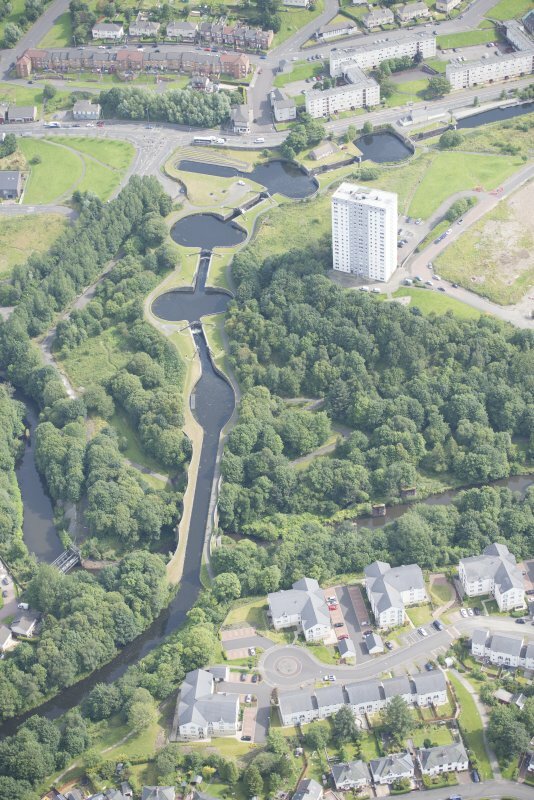 Adjoining the river crossing, to the east, is another Whitworth major feature of his western stretch of the Canal, an elegant stairway of five locks and associated oval basins, raising the navigation level nearly 12m (40ft) to reach the Glasgow Branch into Port Dundas. 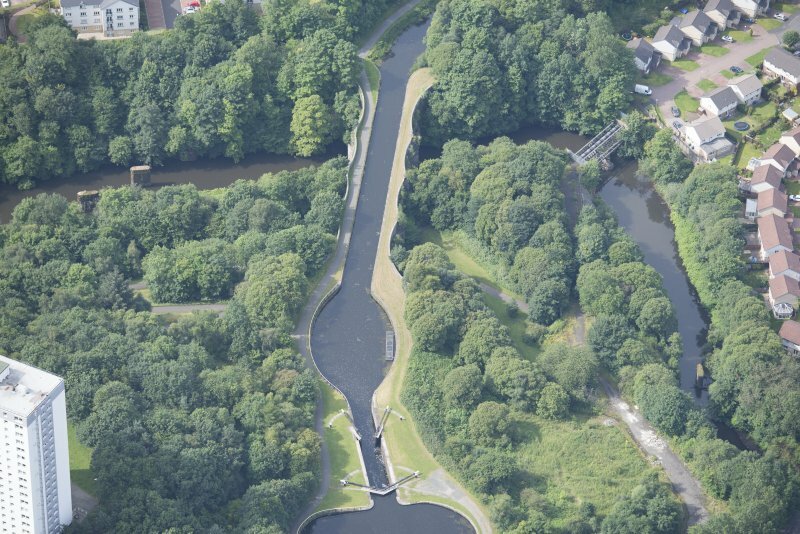 These are among the finest canal features in Britain. For adjacent Maryhill Locks, see NS56NE 84. 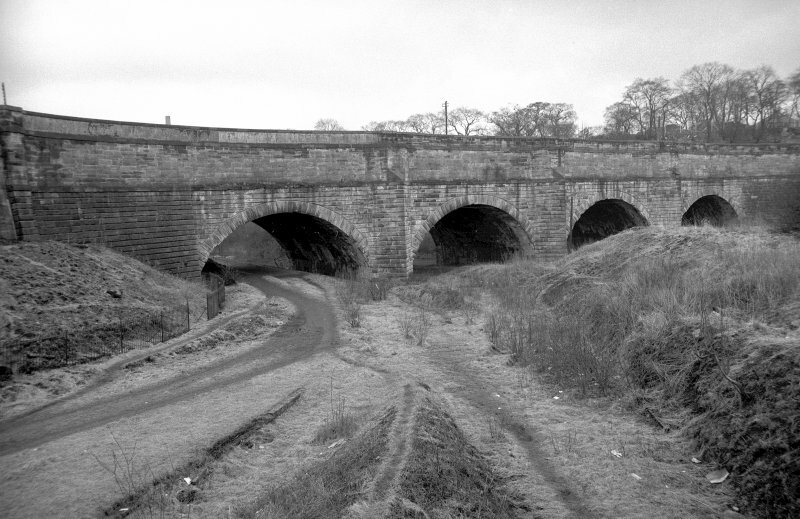 Not to be confused with the nearby aqueduct over Maryhill Road (NS 56719 68867), for which see NS56NE 98. 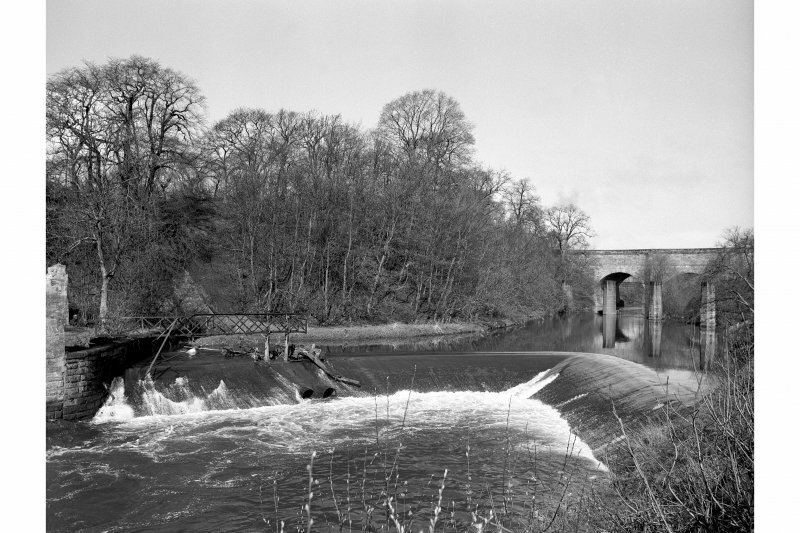 William Gibb and John Moir of Falkirk were awarded the contract for the building of the Kelvin Aqueduct. 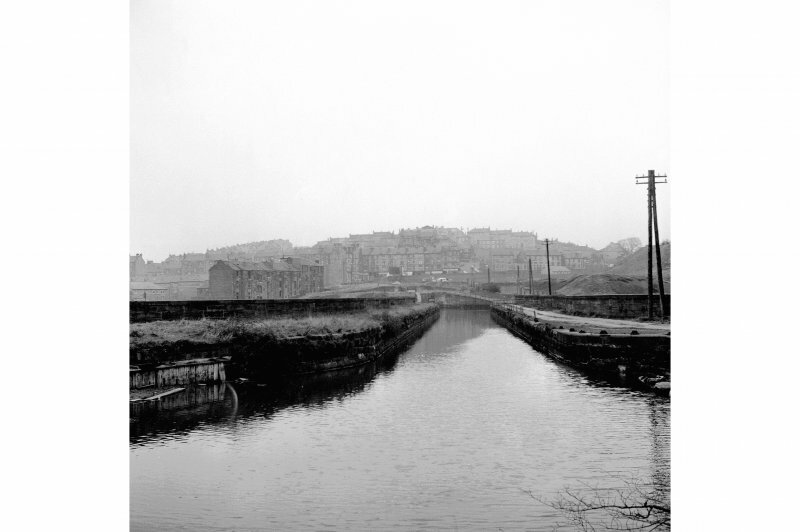 The foundation-stone was laid by Archibald Spiers, the chairman of the canal committee, on 16 June 1787. 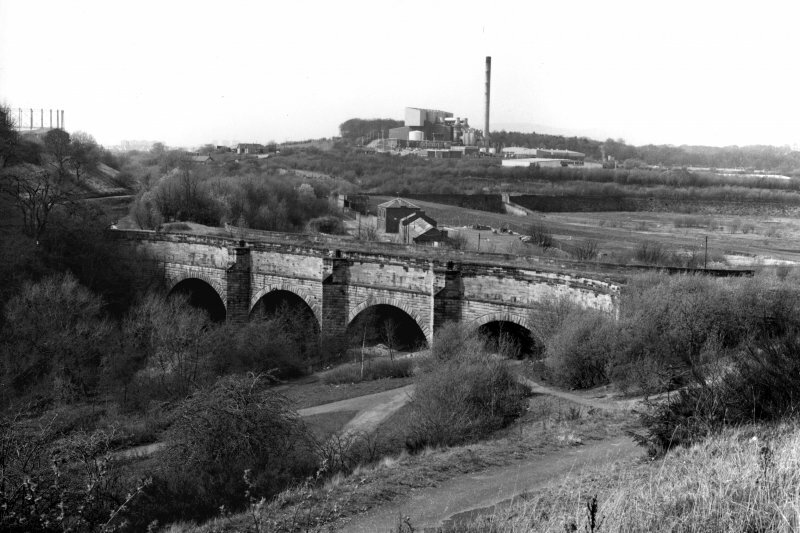 Whitworth undertook constant supervision of the work on the aqueduct, which was seven eighths finished by April 1789, and drew the curiosity of many strangers. 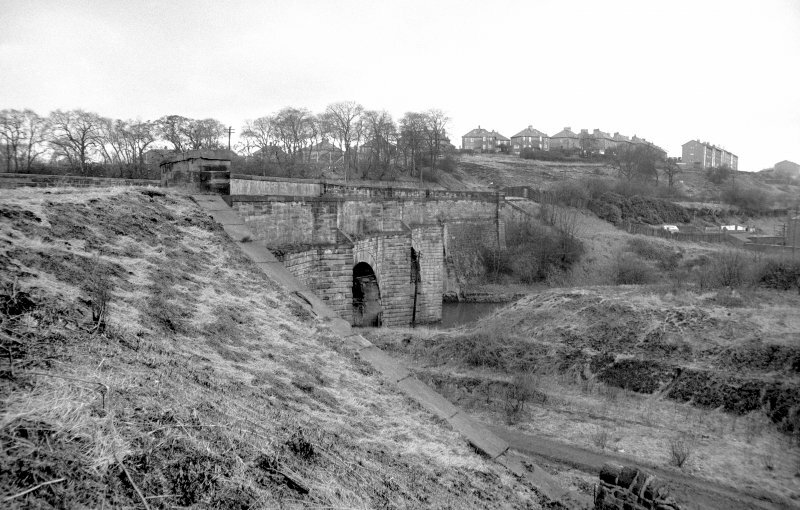 Kelvin Aqueduct, built 1787-90 for the Forth and Clyde canal by R Whitworth, engineer, at a cost of £8509. 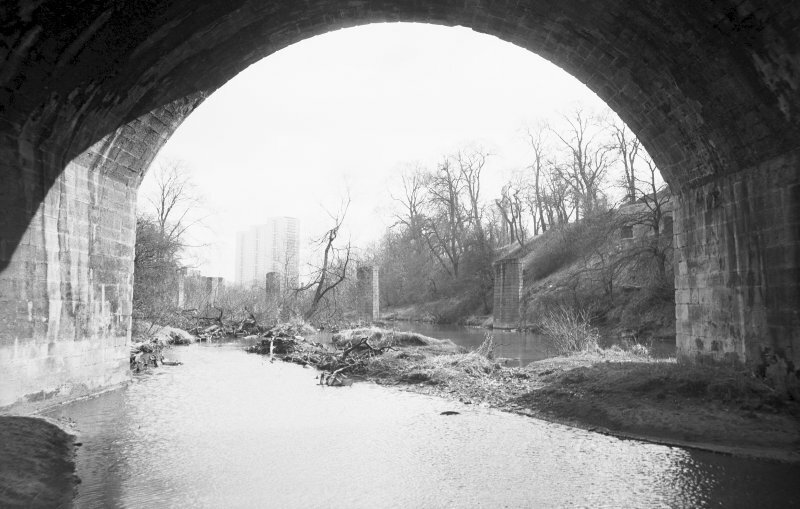 Four heavy masonry arches, each 50 ft (15.2m) long carry the canal over the valley of the Kelvin; only one pier actually stands in the river. The spandrels of the arches are also arched, with a buttress at each pier. The lower courses are rustic ashlar and the upper polished. The entire structure is 400 ft (122m) long and 70 ft (21.3m) high. 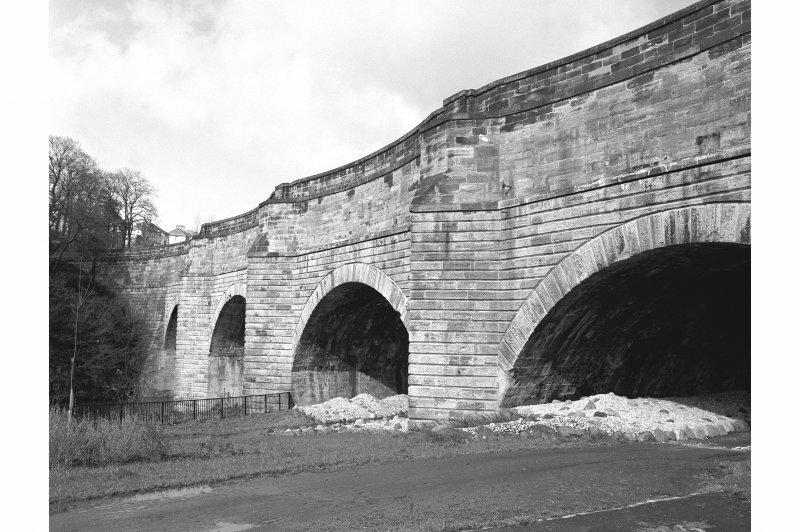 To the W of the Maryhill locks, Robert Whitworth's spectacular Kelvin Aqueduct of 1787-90 spans the Kelvin valley 70 ft (21m) above the river. 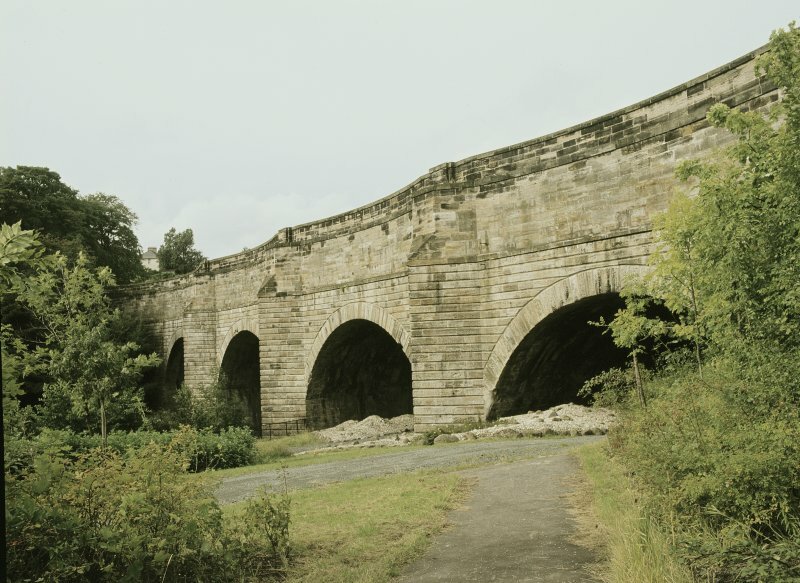 Four massive stone segmental arches, with elegantly curved ashlar spandrels, each 50 ft (15m) long, and four piers with V-shaped cutwater buttresses, heavily rusticated. 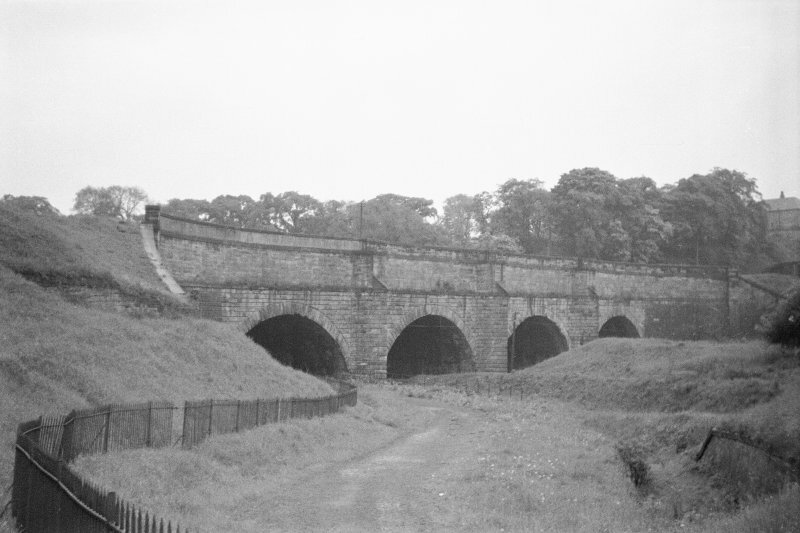 This fine aqueduct was constructed between the years 1787 and 1790, by Robert Whitworth, the engineer who took over the work on the canal when John Smeaton retired. Massive buttressed piers support four fifty foot arches with arched spandrels.. The structure is seventy feet high and four hundred feet long. Its estimated cost of £6,200 was eventually exceeded by £2,300 (£8,500). Due to its impressive nature on completion and the fact that it was the biggest structure of its type in Britain, it inspired poets to write odes in its honour. Today its continuing impressiveness is reflected in its status as a 'B' scheduled ancient monument. 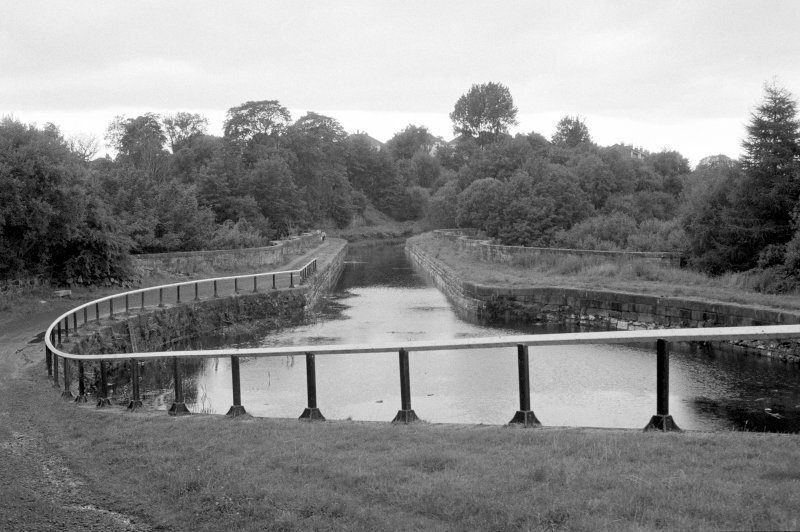 Robert Whitworth, who took over as engineer on the Forth and Clyde Canal when Smeaton retired in 1785, was the brain behind the Kelvin Aqueduct, which was at that time the largest constructed in Britain. Buttressed piers with arched spandrels support the four arches. As regards statistics, it is 400 feet in length, and its height is 70 feet. Construction began in 1787 and by the time it was completed in 1790, it had cost £8,500. This was £2,300 more than its estimated cost. 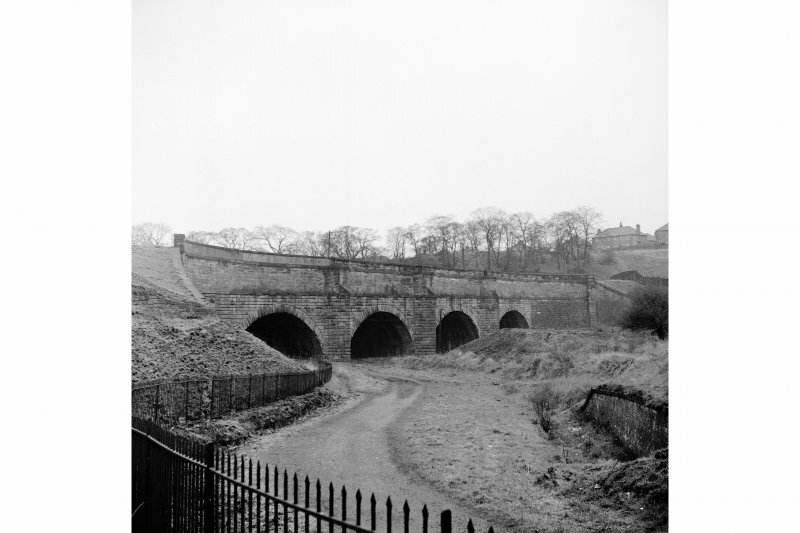 It is conjectured that the strange name given to the area behind the aqueduct, Butney, may be a corruption of Botany Bay, either because the construction was carried out by convict labour or convicts were shipped from this location. A more fanciful suggestion is that labouring on the aqueduct was similar to undertaking penal servitude. 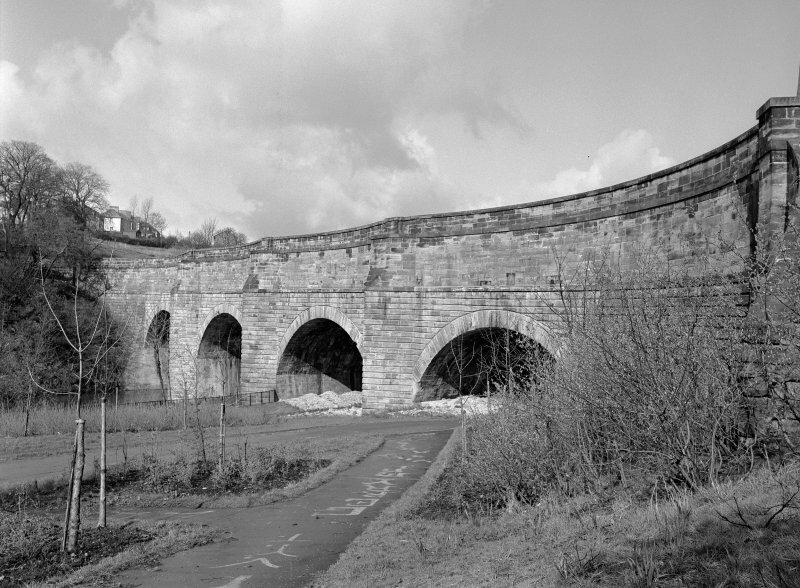 Measuring 400 ft (130 m) in length, and 70 ft (22m) in height, the Kelvin Aqueduct was constructed with four arches of 50m feet or 10 metres, whose solidly buttressed piers support arched spandrels. The estimated cost of £6,200 was exceeded by £2,300. It was a momentous feat, being the largest engineering construction of its kind in Britain in that epoch, and was visited by tourists in their thousands. Poets even wrote odes to celebrate it. 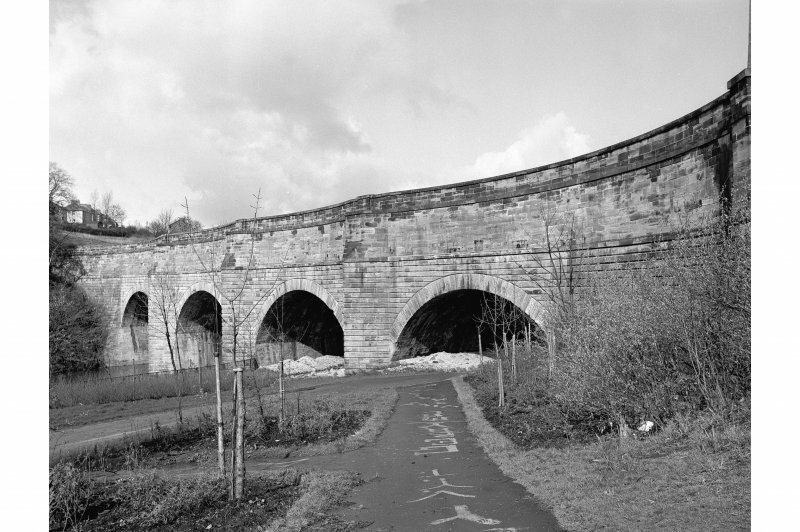 Beneath the aqueduct is the Kelvin Walkway, in the tree-lined valley of the river. 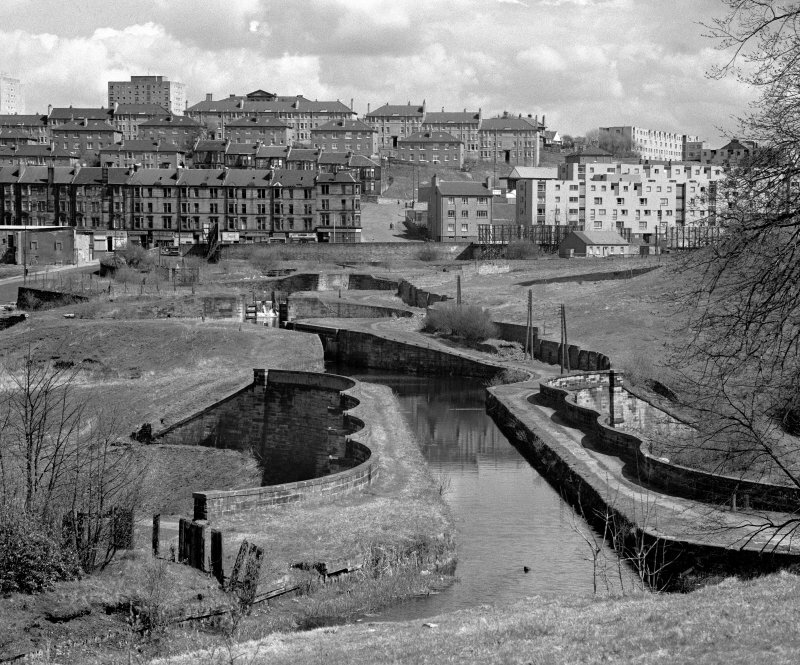 This aqueduct carries the main line of the Forth and Clyde Canal across the River Kelvin in the Maryhill suburb of Glasgow. It remains in regular use by canal vessels and pedestrians. Information from RCAHMS (RJCM), 17 September 1997. This site has only been partially upgraded for SCRAN. 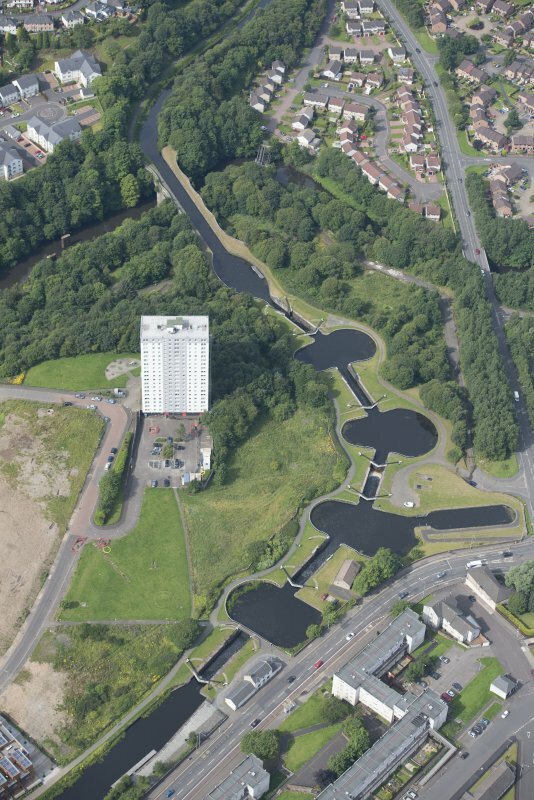 For full details, please consult the Architecture Catalogues for City of Glasgow District. The location assigned to this record defines the centre of the span. The available map evidence indicates that the structure from NS C. 56110 68964 to NS c. 56205 69000. The River Kelvin here forms the boundary between the parishes of Glasgow (to the E) and Govan (to the W), and the towpath is on the S side of the canal. 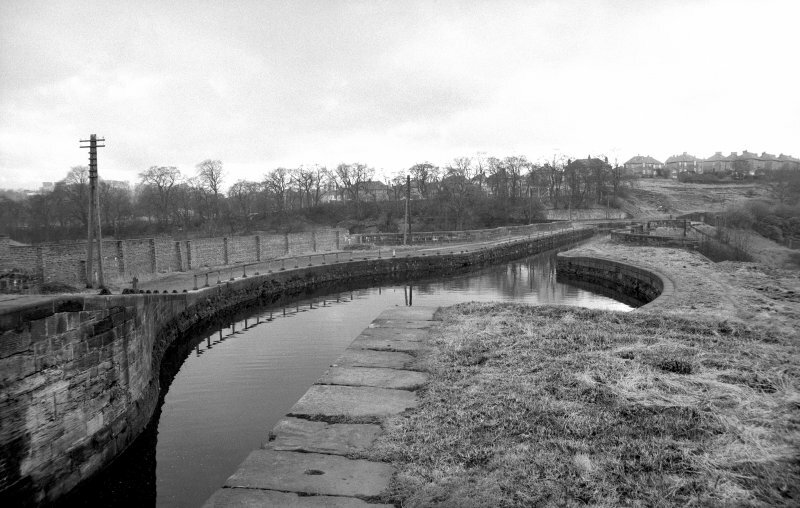 Major engineering structure on the Forth and Clyde Canal. Largest aqueduct in Europe in 1790.
aqueduct was Gibb’s last work before his death in 1791. He was the founder of an engineering dynasty which eventually became Sir Alexander Gibb & Partners. His family motto was Fides Praestantior Auro (to keep faith is better than riches), and in completing the aqueduct within the contract time he is reputed to have made a devastating loss, such was his integrity. 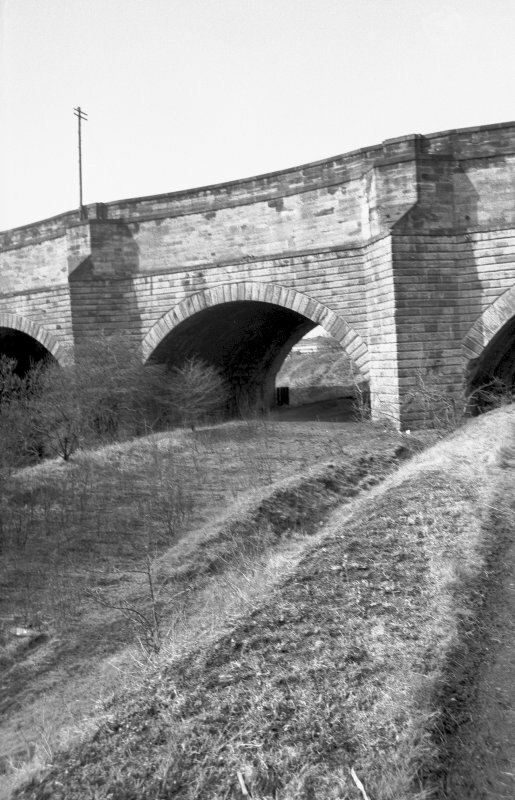 The aqueduct is 400 ft long, 68 ft high, and has four arches of 50 ft span. 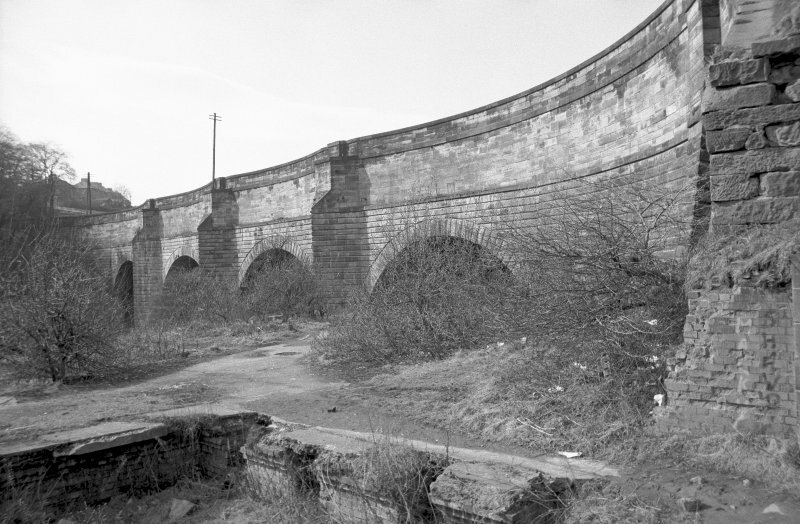 The distinctive features of the aqueduct are the curved retaining walls adjoining the water channel which act as horizontal or lateral arches giving rise to significant reactions at the piers which are resisted by substantial buttressing. 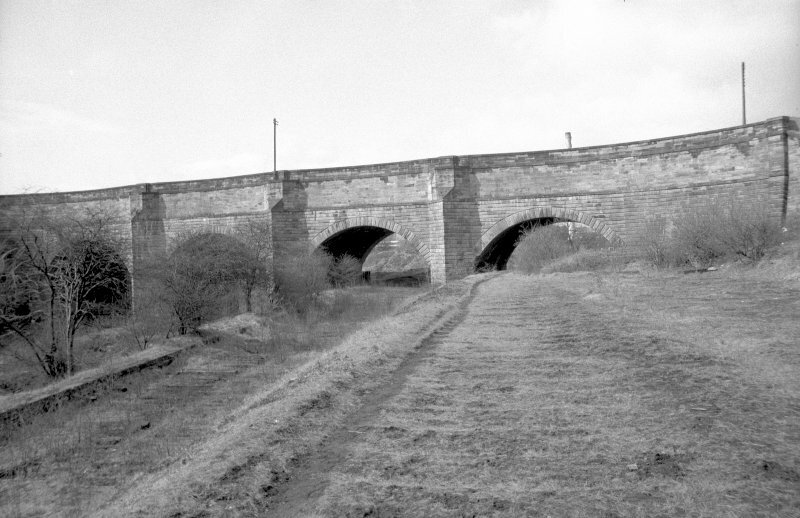 This feature was similar to that employed by Smeaton and Mackell to the same span at Luggie Aqueduct 15 years earlier. 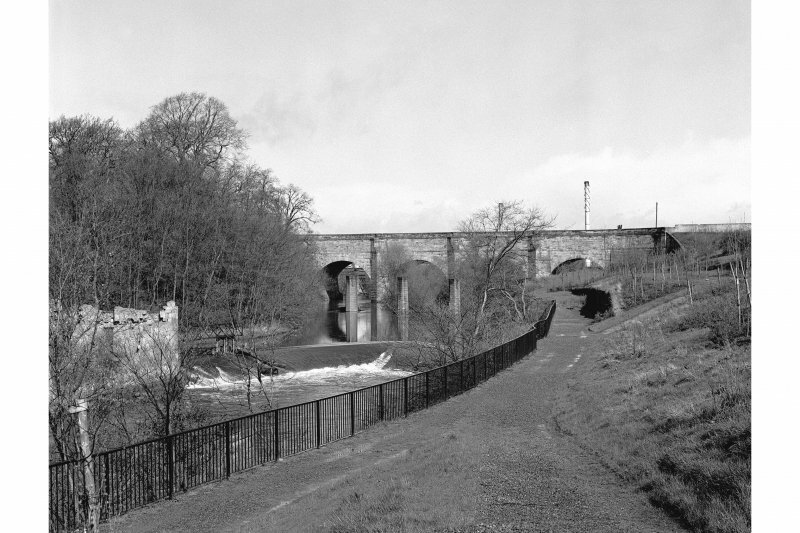 The Kelvin aqueduct was the largest in Europe in 1790. It is also noteworthy for the variety ofmason marks to be seen on the stonework, particularly near ground level. Reproduced from 'Civil Engineering heritage: Scotland - Lowlands and Borders' with kind permission of Thomas Telford Puslishers.